Keep your Austin lawn protected year-round from dandelions, crabgrass, Johnson grass, chickweed and more with Magic Pest and Lawn’s spring weed control services! Magic Pest and Lawn’s spring lawn care services combat common spring weeds, including chickweed, Bermuda grass, henbit, crabgrass, nutsedge, sandbur, and more with our pre-emergent and post emergent weed killers. We also keep your Austin lawns and gardens green with professional lawn fertilization, soil amendments, and additional spring weed control and affordable lawn care services. Spring weed control for lawns is incredibly important in the Austin area. If you don’t take measures to prevent broadleaf and other spring weed growth as early as January, you are in danger of having your Austin lawns and gardens invaded by fast-multiplying and tough-to-kill common Texas weeds. Spring weeds such as crabgrass, grassburs, and Bermuda grass can creep up and take over your lush greenery before you know it, and once these hardy weeds are allowed to germinate without the proper pre-emergent weed prevention, there is little chance you will be able to truly get rid of these weeds for the growing season. When Should You Use Pre-Emergent Weed Control? In the months between January and April, our spring weed control tips include utilizing a pre-emergent weed control treatment to stop difficult spring and summer weeds before they even begin to take hold. Pre-emergent weed killers can be liquid or granular weed treatments that are applied BEFORE annual grass and additional spring weeds sprout. When it comes to pre-emergent herbicides, timing is everything. March is a prime time to utilize a pre-emergent herbicide to prevent summer weeds from sprouting. The spring lawn care and weed control professionals at Magic Pest and Lawn can help you determine the ideal time to apply pre-emergent weed control, so you can stop thistle, crabgrass, Bermuda grass, henbit and other common Texas weeds at the source. 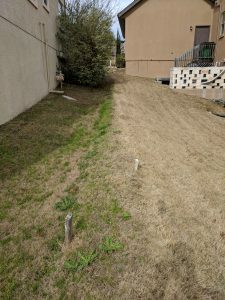 As local weed control and lawn care professionals, we know the unique challenges Texans face when it comes to weeds, and we customize our spring lawn care plans to meet the needs of our Austin clients. If you already notice weeds like crabgrass, nutsedge, Johnson grass, and chickweed in your Austin lawn, it’s time to call Magic Pest and Lawn for a professional post-emergent weed control treatment. We use the most powerful post-emergent herbicides that kill weeds on contact. Once the spring season is in full swing, it is generally too late to apply preventative weed control, so we can help you identify the best post-emergent herbicides for your unique situation. Post-emergent weed control treatments are the most common type of weed control, and are generally liquid sprays applied systematically to patches of weed growth. The best time to apply post-emergent herbicide? The minute you spot something you don’t want growing in your Austin lawn or garden. Magic Pest and Lawn’s professional spring lawn care experts are well-versed in the proper application of pre-emergent and post-emergent herbicides, sprays, and granular treatments. We also realize that not all weed control products are made equal, which is why we are dedicated to staying up-to-date on the most effective, safest, low-toxicity weed killer sprays and herbicides. Spring is synonymous with growth, which means it’s prime time to prep your Austin lawns with the best fertilizers in the lawn care industry, so your grass can flourish in the summer months. Magic Pest and Lawn’s spring lawn care experts strategically apply fertilizers that are effective, environmentally friendly, and guaranteed to cultivate the greenest grass around. Lawn fertilization can be a hassle, which is why we do the work for you without breaking the bank with the most affordable lawn fertilization services in the Austin area. Magic Pest and Lawn’s spring lawn care services will make your property the envy of your Austin neighbors with green, lush, weed-free lawns and gardens. Call our spring weed control and lawn care experts today to take care of all your summer and spring weed control and lawn fertilization needs!